"I don't just want to survive, I want to thrive… I don't want to die here." I started this blog a couple of years ago to chronicle the myriad of powerful thoughts and feelings that came with facing elements of my past… facing my then “homeless” and mentally “ill” father. Life has propelled me in so many different directions after this blog gained international attention. From the speaking engagements, to sitting on panels, to showcasing my photographs, and attempting to write a book proposal… it felt oddly unnatural to be doing all of that at the time. I wasn’t trying to gain any fame or attention from this — I just wanted to help my Dad. And I wanted to honor the relationships and words of the people who so graciously shared and opened their hearts to me — the people who I know are still living on the streets today. The sensationalism that came with sharing my story was overwhelming. And over the past years, I found myself diving deeper and deeper into my shell. I was consciously trying to drown out the noise… trying to regain my own spiritual and emotional balance. It is important to take care of yourself, especially if you want to be able to take care of others. So here I am. I am focusing on cultivating my home, my little world, and thinking about the words in my heart that I long to share. This blog was born from my suffering, from a place of deep pain and years of hurt that bubbled into more than I could have ever imagined. Somehow, sharing some of my darkest experiences has brought life and light into the hearts and minds of others. I feel like this blog is only one part of the story, and I have been wrestling with where and how to move forward and beyond. I have more to give, more to share, more insight that is built on a foundation of love and regrowth that I think could be helpful… the question is whether it’s appropriate for me to share it here? 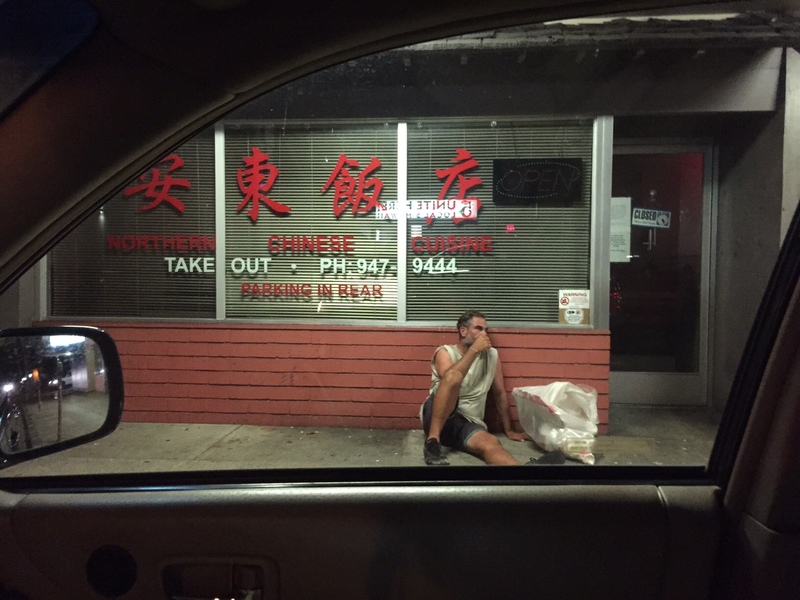 This is the Homeless Paradise. But what I have to give goes beyond the hopelessness of our circumstances, it is about building and cultivating a home. I’m not talking just about a physical space to call your own, I’m talking about the home in your heart — the feeling of self-worth and serenity that comes with truly living and breathing in your own skin. For those of you who have been following this blog, you know of the trials and some of the childhood experiences that shaped my past. These experiences, as painful and confusing as they were, did not limit me from striving for better in my own life. I have always said that my truest desire in life was to have a family, to have a home. It took time, patience, selflessness, and couples therapy (yes, therapy) to build the life that we have. So, where am I going with all of this? I’m thinking about continuing the story, but peeling away the layers and sharing nuggets of wisdom that I’ve stored in my heart… I once read somewhere that when you’ve reached your goal in life, you don’t just bask in your success and go merrily along… no, you turn around and help others to reach theirs. My family isn’t perfect, I’m not a perfect wife, I’m not a perfect mother, but I am grateful for the family I do have and the home that I do have. My greatest accomplishment in life thus far is knowing that I’ve broken the cycle of abuse and dysfunction; my soul is free to create the life I’ve always wanted and needed as a child. I have become the parent I needed as a child, and have created the home I yearned for. When the dust has finally settled and you emerge, what do we do? When the pain has finally faded to a dullness that you’re not quite ready to ignore, but don’t want to prolong, how do you move forward? Ultimately, when you’ve been given a second chance at living your life the way you want to, how do you pick up the pieces? It takes time and conscious redirection of negative energy into positive. Maybe this is the wrong place to share these thoughts and feelings, but I felt compelled to reach out to you all. You have “followed” my journey all these years, and you know how hard it has been… I’d like to share the light now. Let me know if it’s something you think would help. I met Derrick standing by a bench next to the Kapalama Canal. His deep tan seemed to glow against the reflection of the water. The air felt clean and my skin was still cool from being at the news station for my morning interview. I glanced at him and made quick eye contact. He was busy talking to someone and our eyes met again — this time I waved at him. He nodded and smiled. I awkwardly introduced myself, almost interrupting their conversation, and sort of back-stepped towards a bench. So, there I was. I wanted quiet. Some “me” time. It is always emotionally draining to expose myself… to be vulnerable to a public audience, even if I’m just sitting under bright lights with a really warm reporter/human-being next to me. It was nice to be outside… a good break from where I had just been. I sat there alone, on the picnic table, and watched people come out of their tents. One lady was preparing her breakfast — it smelled like she was frying up some eggs and sausage. My stomach started to growl. I hadn’t had breakfast yet. My attention came back to Derrick. His friend was gone and he was standing right next to me. Smiling, he asked what I was doing here. “Here we go,” I thought. I was honest. I told him where I had just come from, my journey, and my nervousness about sharing personal details of my life. He listened attentively. Layer by layer, I shared my hopes, my pain and fear. I mentioned how I felt so alone at times. And how I appreciate the quiet and solitude because it is a reminder that I, alone, will have to face my fears and manifest my hopes and dreams into reality. It’s that moment of pause we have in life that gives us the freedom to choose our next step. 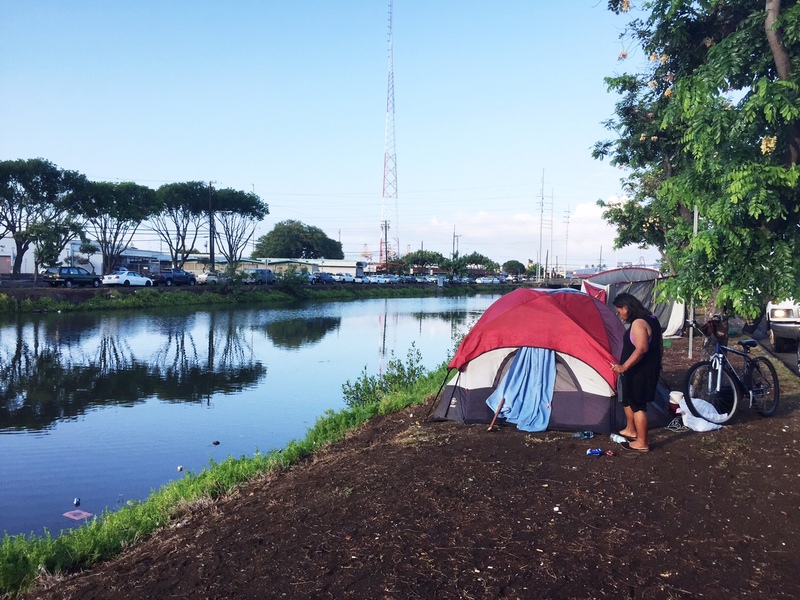 A one-mile fence will be built along Kapalama Canal to prevent homeless camps. I went on to share my thoughts about the money that would be spent on building the fence. I explained my belief that helping isn’t always about spending money. As children, we are oftentimes asked if we want anything… if there’s anything we can buy to make them happy or feel better. And it isn’t necessarily a bad thing to buy a gift or a token of our appreciation. But it is the thought and intent behind it that truly touches the person… touches the child… It’s about love. People want to feel loved, to have someone listen to them and their feelings, and be held when they’re not feeling good. I’m not so sure that building a fence will help the situation. He shared his own life story — how he had lived a life of incredible financial freedom at a young age. Derrick had money, lots of it, and he blew it all away on the “wrong things” in his early years. 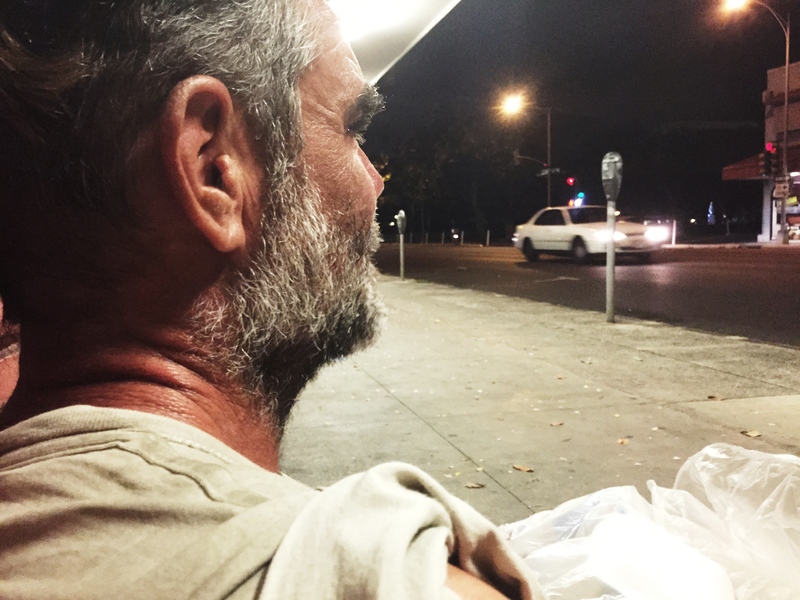 He remembers a time when he would drive by homeless people, scoffing at their circumstances and turning away from them — seeing them as failures in life. My stomach started to growl. I asked if he was hungry and his response made me laugh. “Girl, I am one Hawaiian braddah, I can always eat.” Thank goodness. I was starving. We walked over to the nearest Zippy’s restaurant and ordered rice, eggs, and portuguese sausage. He liked his rice the same way I did — colored with shoyu and tabasco. Perfect. We sat by a big window and he shared more about his life and the new perspective and life path he was on. He enjoys helping people. Derrick reflected on a time when he had “everything,” yet he was incredibly unhappy with life. And now at the cusp of being 50 years-old, he has very little in the material sense, but has never felt more content. He is happy. He is learning to be at peace with himself, and being on the streets is part of that journey in helping him to get there. I grew up in Hawai`i, but cannot claim to fully understand the incredibly deep, interconnected, and enriching history and language of Hawai`i. 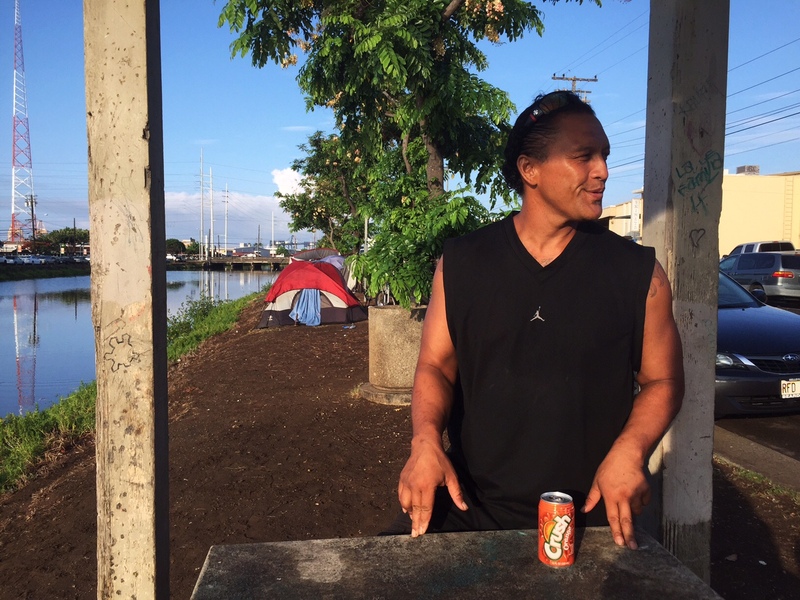 However, I do have a deep respect for Native Hawaiians, like Derrick, who are part of an ongoing economic, social, cultural struggle that threatens the cultural practices and way of life of Indigenous Peoples. For those who are interested in learning more, I highly recommend reading “Who Owns the Crown Lands of Hawai`i?”. He explained that many people living near Kapalama Canal express frustration in wanting a subsistence way of life, but not having the option to. At the same time, there are many who are depressed and need a friend. I realized that Derrick and I were a lot alike in this way… Wanting to be a friend, feeling connected to ourselves by connecting with others, but also appreciating our moments of solitude to recharge and reflect. I wondered if he was depressed. 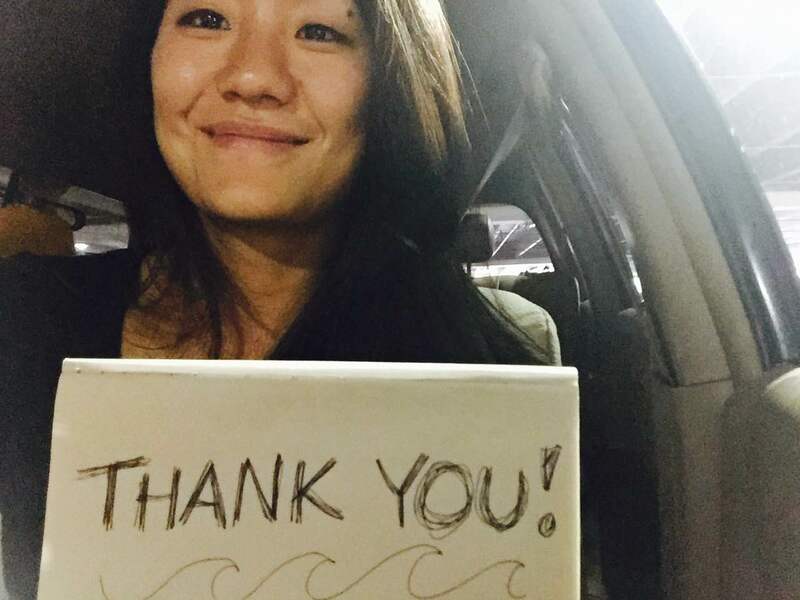 I openly shared how, in retrospect, I was depressed while my father was homeless. And how I learned to deal with being alone, compartmentalizing the pain, in order to keep things together in other areas of my life. It was so hard, and I know I’m a different person because of it. I have grown, no doubt, but I have also learned how to approach challenging experiences as an opportunity for growth. And I don’t mind having to push myself… I’m accepting what it means to be uncomfortable. “Kūlia i ka nu‘u,” he said. Derrick acknowledged what I was sharing. I was revealing myself to him — a period of personal turmoil that I really hadn’t broken down yet. It was hard, but I got over it. And that’s really all that mattered. But he didn’t mind listening to the details, watching the layers unfold that morning, as I was fresh from just sharing my story live on-air. 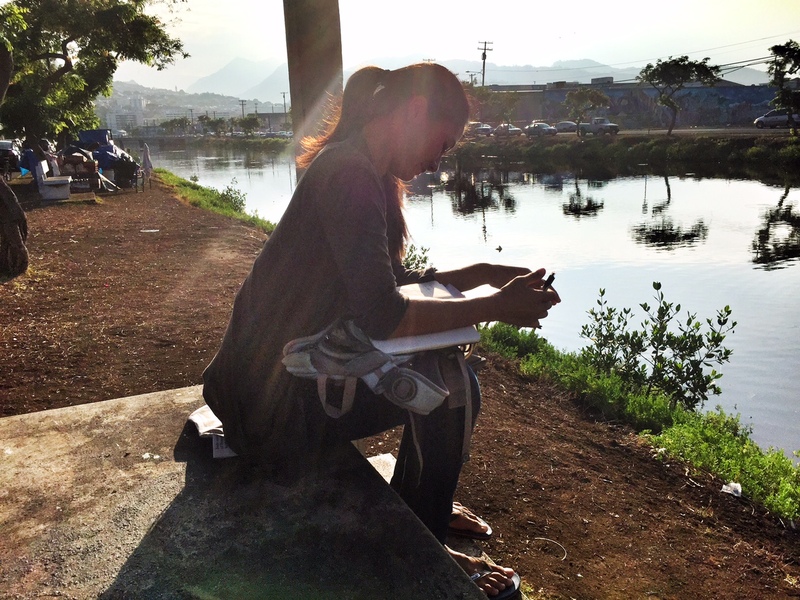 A photograph taken by Derrick of me sitting by Kapalama Canal. When you take the word “depression,” and you cross out those letters, you’re left with the words “press on.” If you don’t “press on” in life, then the three letters you took out spell “die,” and you will surely “die” because of your depression. “So, Diana… press on, kūlia i ka nu‘u, strive to the summit” he said. Yes, Derrick. I will. It has taken me over a week to write this post… I’ve held onto the strength and thoughtfulness of his words… of the life that is woven into his words… It means a lot to me, and now I’m sharing them with you. As I drove away that morning, I felt happier… understood, validated… I smiled knowing that he had helped me, and I had helped him. We saw each other and our hearts nodded quietly as I waved goodbye. It’s never truly goodbye, though. Deep down inside, I know I will see him again. Vincent and I taking a moment to capture a photograph together. A few days ago, I agreed to do an interview with BBC and found myself sitting in the Hawai`i Public Radio station at 9:00pm waiting for a call from London. As I sat and waited for the reporter to ring in, I looked around the room where I “came out” and shared my story for the first time. It was surreal to hear the voice on the other end ask questions about my life. 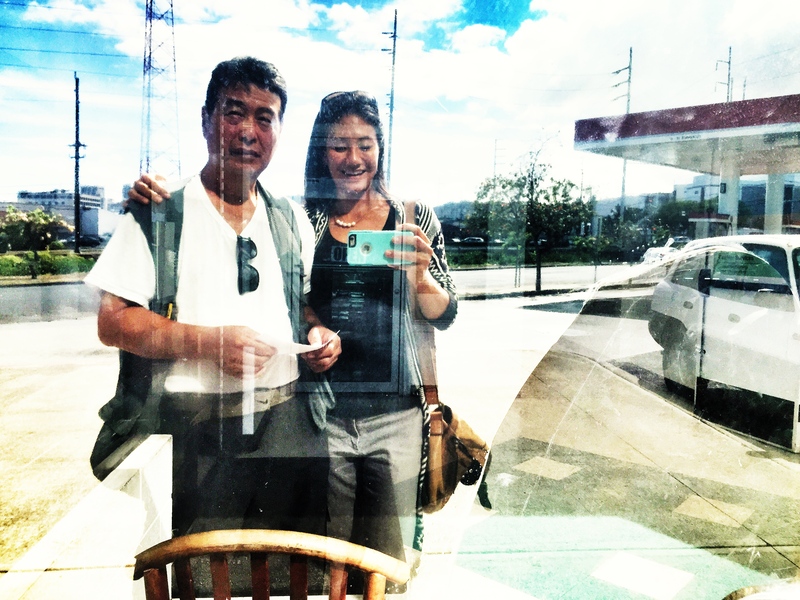 We spent nearly an hour talking about life and my personal experiences with my father. What it was like to see him for the “first time,” and what that “first time” really meant. At the end of the interview, I really wasn’t sure what the direction of the story would be. I know it is largely up to the reporters to edit… we shall see. It was past 10:00pm by the time I walked out of the station. I realized that the last time I made this drive home at night was when my father was still on the streets. As I quietly drove down the street where my father use to sleep, I felt the need to pull over. I pulled the car to the side, in front of a meter, like I had done hundreds of times. And then I walked out towards the doorway where my father slept. I stood there by myself… soaking in the fluorescent light hanging from the storefront. I raised my fingertips to the sides of the doorway, feeling the roughness of the frame. Slowly, I sunk down to the floor and breathed in my moment of solitude in that doorway. “He survived… He got out,” I said to myself. I said a quiet prayer that night… to the world, to my universe/God/creator. As I got back into the car to drive away, I noticed a man walking towards my direction. He had a bag full of recyclables, just like my father did. I was getting ready to leave, but I felt this pull to stay. I rolled down my window and waved at him. He looked surprised. I smiled at him and asked if he was hungry — if it’d be alright to hangout with him. He nodded that it was. I sat next to him and learned his name… Vincent. 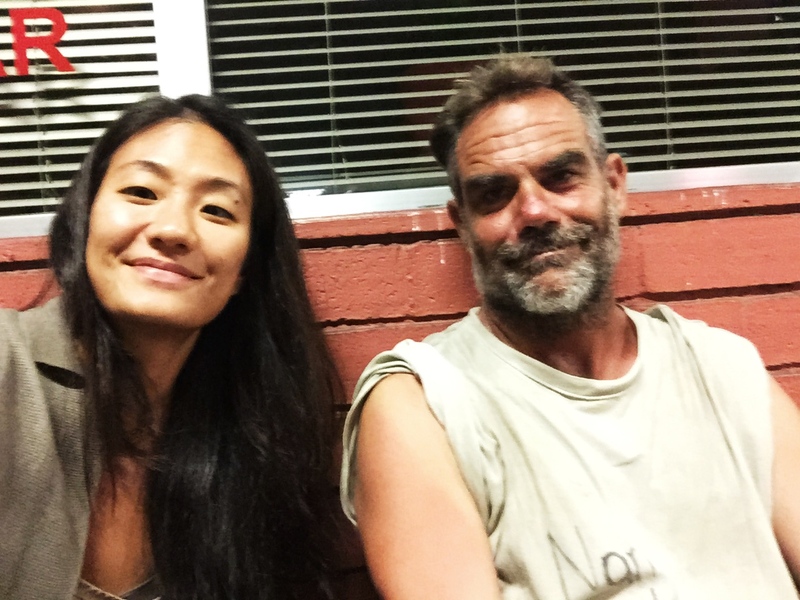 That he has been living on the streets for quite some time, wants to be a marriage therapist to help couples and families with conflict resolution. I could tell that his more recent relationship issues were plaguing his heart, and that he was carrying a painful weight he couldn’t accept. Vincent gazing at the cars passing by. Hearing this made me smile. Vincent was kind enough to point out that my life journey was already manifesting this purpose. And then he brought up his desire to be a marriage therapist again. I could tell this was really important to him… And in some weird way, I actually felt like he already was a therapist. We spent over an hour sitting there, counseling each other, sharing our thoughts, sparking a friendship, and appreciating each others’ existence. There is something so raw and true about connecting with an open heart. I thought about my own experience as I shuttled by Dad around at the DMV. I anxiously watched my Dad engage with the check-in receptionist and road test examiner. A part of me wanted to talk to the receptionist for him, but I forced myself to take a backseat and let him do it. He gave her the license and registration, insurance card, and confirmation e-mail I had printed out for him. We walked over to an empty bench and I playfully shared my experience in failing the test. I think it was my way of reassuring myself that it would be okay if he didn’t pass for whatever reason. My heart smiled knowing that we were creating another memory together — making up for a missed opportunity. His name was finally called and I jumped up closely behind him as the examiner ushered him to the parking lot. I could feel the butterflies of excitement building in my gut and smiled proudly as he walked towards the car. Wait, maybe we should have practiced in my car? I watched as he fumbled trying to get the automatic door opener to work — crap, the battery was dead on that device, he would need to manually stick the key into the car door and turn it. My Dad looked over at me, and I signaled to stick the key into the door and turn. I quickly signaled again while the examiner had his back turned to me. He got it. Phew. He drove off smoothly… good, I thought. I sat alone in a metal patio chair left obscurely by the wall and absorbed the scene in front of me. Teenagers were rushing by with their anxious parents, an elderly woman in a wheelchair was escorted into her car, and a man who appeared to be homeless stopped in front of a garbage ban to look for recyclables. The vision of my Dad on the streets flashed back into my mind, as I watched this man pluck out empty cans. He looked up and smiled at me, I smiled back. He walked away towards a friend before I could stop him to talk. Another time, I thought. So this is what it’s going to feel like when my boys get older and it’s their turn to take their road test. I started to get lost in my own thoughts and didn’t realize half an hour had passed. I got up to see if they had returned, and the car was parked around the corner. As I walked into the DMV, I saw my Dad talked to another receptionist and quickly made my way over. Did he pass? Please tell me he passed! He was beaming, a full ear-to-ear grin. His smile reminded me of my older son’s smile. I gave him a hug and stood back to let him get his paperwork processed and have his photo taken. God, thank you. Thank you for this moment, for this second chance. As I finish writing this blog post, my heart and mind is connecting with the hundreds of e-mails and comments I have received from people all over the world. People who share similar stories, understand the struggle, have experienced the pain of not having a healthy family or upbringing, and especially those who lost their parent(s) and were never able to have that “second chance.” I want you to know that I truly appreciate your messages and am sending you hope, love, positive and healing energy. Thank you for being part of this journey, for reaching out, for caring, and for allowing your heart to be touched by mine. It means everything to me. I am so overwhelmed by the constant stream of positive and loving e-mails from all over the world. I wish I could respond to each one individually. It means so much to hear from those who have experienced, or are currently experiencing, what we went through the past couple of years. I met with my dad earlier today and I asked him about his goals. He is still doing well and following his treatment plan, but I can tell he wants to gain more of his independence again. He wants to work, earn a living, and stand on his own two feet without any government assistance. And I know that he doesn’t want to be in an assisted living environment for the remainder of his life. I want the same for him, yet the memory of him on the streets is still incredibly fresh on my mind — especially with all of the recent news coverage that has been coming out. I suggested that we go to the DMV tomorrow to setup an appointment for his road test. He has his Driver’s Permit, but has to go through steps to get his license again. I’m really looking forward to it — it’ll be another new experience and memory shared. We’re still taking things day-by-day, and learning what it means to have a relationship and maintain it. It’s sweet and endearing. I’ve learned that we don’t mind sitting quietly together. Sometimes, all we do is eat our food in each other’s presence. We occasionally look up and smile at each other… laugh… and share a few thoughts and then depart with a hug. Other days, he’s in a really talkative mood and asks a lot of questions about my life, work, school. I take it day-by-day and try not to have any expectations. I think that’s what helps to keep us on this path together. All of this is so overwhelming (in a good way). And I continue to be amazed with how small and interconnected my community is. Just the other day, I serendipitously met a woman who turned out to be the owner of the store that my father frequented before he became homeless. She remembered when he was a taxi-driver and witnessed his slow physical and mental deterioration. She also recalled my late-grandmother… It was really hard to share that my grandmother had passed away before my dad got off the streets. It has truly been a roller-coaster ride and it’s this kind of spontaneous and unexpected occurrence that continues to validate my heart and mind. I am so glad that others have been touched in a positive way, and have reached out to me with their own stories. I spent so much time being afraid and hiding from the reality of my dad’s circumstances… and in my own life… but if you step back and really look at it for what it is, you realize it’s just l-i-f-e and everyone has some painful experience they overcame or are trying to overcome. We can’t control things even if we want to. People have asked about my thoughts on the homeless “issue,” and I oddly accept that the homeless condition will never completely go away. Life isn’t black and white — there are shades of experiences that people go through. Some will go in and out of homelessness… some will choose to live on the streets, others may be incapacitated and require legal assistance and/or medical interventions to get back on track. But no matter what the circumstances are, the most important thing to remember is that they are people. And people deserve to be treated with respect even if they’ve hurt you. Maybe that’s just my way of breaking negative cycles that have been passed down generation to generation. This life is happening now. We are here now. And I’m really grateful for the opportunity to share positive energy with my dad today. We do what we can, with what we have, when we have it. Thank you for sharing this life journey with me… keep smiling, keep loving, keep trying to find it in your heart to forgive, and it’s okay if self-preservation means you have to walk away so somebody else can help. Sending my warmest wishes to all the readers tonight.